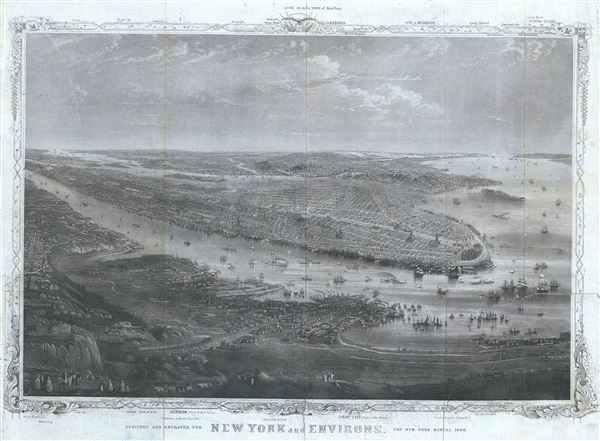 A stunning and rare 1868 view of the island of Manhattan, New York City by W. C. Rogers. The view depicts the entire island of Manhattan with Hoboken as well as parts of Brooklyn and Queens. Important buildings, especially churches are depicted with considerable accuracy. The harbor itself is full of sailing ships. Prepared for inclusion in the 1868 edition of Joseph Shannon's Manual of The Corporation of the City of New York. Shannon, J., Shannon's Manual of the Corporation of the City of New York<.i>, (1868 edition). Good. Some toning and wear along original fold lines. Verso repair over tear in lower right quadrant. Lower left margin extended.